Coyotes communicate constantly through eye-contact, as I’ve written about many times. The communication can become stronger with an intense gaze or stare, and the communication can turn physical, for emphasis. I’ve seen females prod or poke their mates either with a paw or their snouts, or even push with their forelegs and entire bodies, to get the other coyote to do something. I’ve given some “proding” examples previously in Intruder: Territorial Fighting (slide #30), and Pestering. The injured male insisted on remaining out in the open and visible (he has been primed by human feeders and befrienders to hang around — note we are working on eliminating this human behavior), whereas it appears that his mate’s instincts were telling her that being exposed out in the open wasn’t such a good idea. Coyotes do watch out for each other. HE did not seem to agree with her wisdom and resisted her. She persisted in upping her communication intensity, causing him a lot of anguish and uneasiness which can be read in his tense body stance and movements. This series of photos shows a progression in intensity of communication between a protective female mate and her resistant, injured male “better-half”. The female begins her communication to the injured male (above) by simply making him aware that she’s there: she walks over and lies down close by under the bushes where she is somewhat hidden but “present”. He must have sensed her gaze from that distance. I missed the signal, but before she even gets up to approach him, he bolts up guardedly and looks in her direction: has she emitted a sound that has alerted him to her intentions? Next (above) she approaches him decisively, places herself directly in front of him, only inches away, and looks at him razor-sharply in the eye. She holds that gaze for many seconds. The gaze breaks for a second, but then recommences closer and more intense than before, and she gives him a little tweak of the nose — first with a nose-lick and then a nose-nip. He squeals in pain and moves away from her mouth, standing erectly and guardedly. When she begins turning her head in his direction again, he lunges away. When she looks at him again he returns a pained and uneasy look — it’s his muzzle that has been injured (above). She seems to understand and now uses her paws to push/prod him to get going, and then gives him a whole body push. He responds by distancing himself from her. She approaches him again (above). He walks off with her obediently. After more of the same, he relents, and she finally is able to lead him away, reluctantly at first, but he does follow, tarrying a little and resisting by sniffing as they move along, and eventually stepping in line with her, until they both disappear into the underbrush. This is a clear *message*. It’s so easy to abide by it to avoid escalation. Simply tighten your leash and walk away. If the message is ignored, as seen below, a coyote could up the ante by attempting to nip the haunches. In this case, the coyote pinched the dog’s ankle which made the dog wince and move on. The owner could easily have prevented this by leashing and moving away from the coyote. Maybe a *nip* is in order to clarify the message? In one of our parks, folks have been worried recently about the sudden change in behavior of their neighborhood coyote from fairly mellow and chilled to snarly faced with bared teeth, high arched back, tail tucked under and sometimes walking on tip-toes. I call it a halloween cat pose. Please know that this is an challenging display that may not need to lead to an attack if the dog and owner understand it. This is *messaging* in the only way this coyote knows how. This stance is taken towards dogs that come too close, leashed or not — it’s a classic posture. Please keep dogs as far away as possible from the coyote so that dogs and coyote may feel safe. 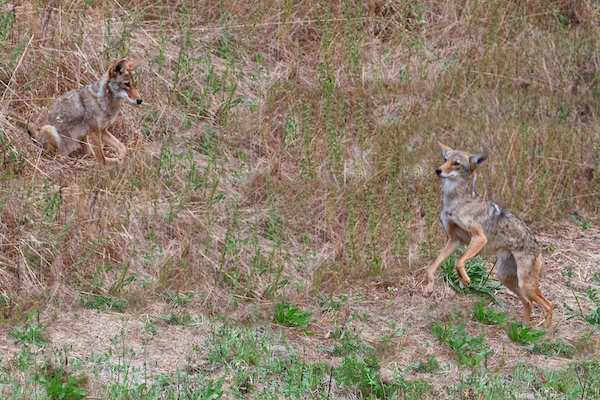 It’s pupping season, and whether or not any coyote is having pups, during this time of year it will display more defensiveness for its self and its space. If the coyote ever comes in your dog’s direction, simply leash and walk away. There’s no point in challenging it simply because it wants to defend itself and defend the only space it has. Here is what has been experienced in one of our parks: 1) One individual suggested that he thought it might not be a good idea to give-in to the coyote’s demands by leaving — he thought this might be teaching the coyote the wrong *lesson* — that it might be best to *push your way through*. He has had good results with scaring the coyote off, but the coyote continues to habitually follow him and his dogs. 2) Someone else said that the scaring tactic didn’t do a thing, and that the coyote followed several hundred feet, even though there was no dog involved here. 3) In another instance, a dog-walker saw the coyote on the path, stopped and waited for it to run away, but it wouldn’t. The result was a standoff — each waiting for the other to leave. The coyote arched its back, ears back, tail down, and showing teeth. Continuing on their walk caused the coyote run away, but one time it came back and followed a little. I’d like to comment on these experiences. We’re learning that coyotes, over time, just get used to “hazing” and eventually stop responding — then, when you really need a tool to get the coyote away from your dog, you won’t have one. The better tactic is avoidance. It’s probably not a good idea to *push your way through* or walk in the coyote’s direction. By doing so, you aren’t *teaching* the coyote anything except that your dog is a threat. *Backing down and leaving* teaches the coyote that your dog isn’t a threat. A *standoff* is a challenge. Over time, the coyote could even become more reactive — upping the ante to get his message across. You wouldn’t have a standoff with a bear or even a skunk! Instead, be wary of the animal and keep away from it. Best to turn around and leave, and then come back a few minutes later. The coyote could be protecting something of value, be it a food source or maybe even a den. As a rule, coyotes don’t go up to humans, but they can become food-conditioned to do so. So if a coyote follows you, there’s a possibility that the coyote may be hoping for food which he/she has received from walkers in the past. All of us need to be ambassadors for the coyotes, spreading the word to not feed and not engage in any way with this coyote. MOST following is out of simple curiosity, or because they want to find out why they have become an object of interest to you. If they feel threatened by your dog, the coyote may follow to assure itself that you and dog are leaving: the coyote is just being cautiously vigilant and protective of its space. This is a manifestation of their *wariness*. Sometimes a close chance-encounter can’t be avoided, in which case both you and the coyote may become startled. Here again, the coyote may follow you. My advice is to just keep walking away. Don’t engage, and walk away. Avoidance is always the best policy: Avoid, Avoid. Any type of foot-stamping or scaring should really be done only as a last resort, and always as you are walking away. You don’t need to *teach* the coyote anything — just walk (don’t run) away from it. Walking away shows you are not interested in him — and this is what the coyote wants to know. By the way, turning around and facing the coyote — gazing at it — as you walk off is often enough to prevent it from advancing further. 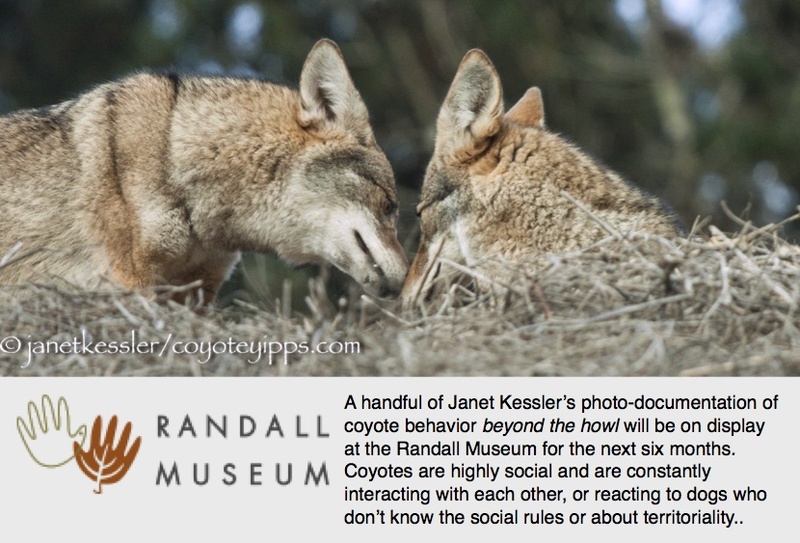 Feeding and friendly engagement of any kind is what will teach a coyote the wrong lessons — they are hard to unteach. 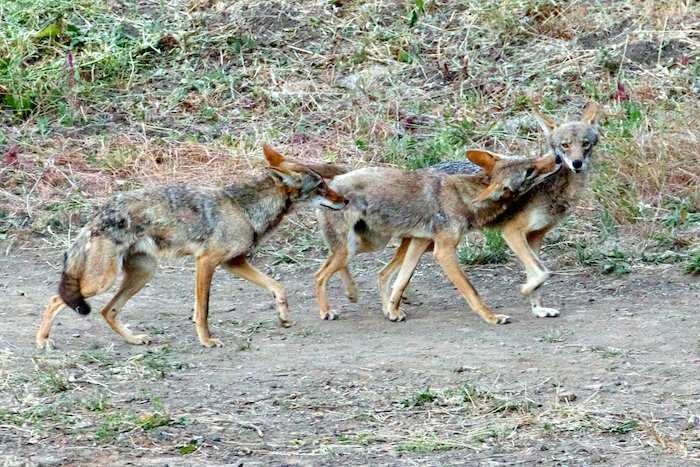 Avoidance, as I’ve seen over many years of observing urban coyote interactions with dogs and people, is your most effective option, resulting in a win-win-win solution for everyone: dogs, people, coyotes. The little guy to the right ran circles around the gal to the left in an attempt to get her to play: they are siblings and BFFs, but she couldn’t uphold her end of the deal. She just sat there and watched him. He eventually gave up and walked on with their dad, but he turned around to look at her as he walked off. She watched him go and, in my eyes, she looked sad. When she got up to go — to follow them — I finally could see what the problem was. She was limping. She held her left front leg out in front of herself awkwardly as she limped. She could keep up with the two others, but she preferred lagging behind them, possibly to avoid the rough play she was accustomed to. It was dusk and I couldn’t see much — the camera could see better than I could. When I reviewed the photos later at home, I could see that she had been holding that left front leg up in front of herself the entire time. These animals are very astute. I’m pretty sure her sibling and fellow playmate knew that she was hurt and in pain. He probably was trying to raise her spirits by inviting her to play. She could not. Hopefully it will be short-lived injury. There was almost no light, and there were tall grasses between the camera and the coyotes, so these photos are totally washed out and blurry. However, the behavior depicted in them is absolutely fabulous: I decided it was worth it to post them, so I enhanced them as best I could. A little female yearling coyote “teases” her dad and then her brother by affectionately stretching herself on top of them, and either nuzzling their legs as in the case of her father, or nuzzling their ears, as in the case of her brother! Her behavior was good-willed fun. It was not meant to provoke any kind of reaction — it was simply a display of her affectionate teasing. It looks like this little gal has two BFFs!! She had been out alone, whiling away the time until the daily family get-together/rendezvous time. Then her brother appeared and he was absolutely ecstatic to see her. He seemed to “jump for joy” as she and their dad approached him: first he performed one bounce, then one squiggle sitting down, and finally a jump, squiggle and bounce all at the same time! Then they all piled up together where there were the usual kisses/nose-touches and wiggly-squiggly movements which are a dead giveaway for the excitement and joy they were feeling. After the general excitement of the initial encounter and greeting died down, the female youngster “hopped on Pop”. It was affectionate contact that they both soaked up. She then twisted her head down and around him and gave him little love nuzzles and bites on his legs. Wow! The three then broke out into an intense play session: they chased each other wildly, they wrestled, they groomed each other — no photos because the movement in tall grasses with no light just shows blurs. These are all activities which regularly follow the initial rendezvous greetings after spending the day apart sleeping. During the intensive play period, the female youngster jumped on her brother, as she had done to her dad earlier. Only this time she tugged at one of his ears and then the other, teasing him affectionately. They played intensively some more and then ran off and out of sight. They would spend the night trekking! Dad came part way out to my dog Holtz and me to defecate. He scraped dirt unenthusiastically and walked away. His message said, in a word, “Mine.” He chose to walk towards us using an access road, that choice also showing his low interest level in us today. It wasn’t the direct route to us. The second half of the video shows Dad a little later, a bit further away and closer to the fence bordering his field. His barks are a territorial message. I’ve rarely seen him barking out his claim to the field. Considering his lackluster performance earlier, I’m puzzled as to why he felt that he needed to vocalize. It didn’t last long and when done he walked away. No other coyote answered his barks. Perhaps his pack understood that Dad was not talking to them. I then went to the bridge hoping for a pack reunion and giving Dad more space. Once there I didn’t see Dad or other coyotes. I packed to leave and saw a homeless man, Larry, coming towards me from the east part of the field. Arriving, he asked me if I had just seen “…that coyote run off?” I hadn’t. Dad had been watching me and I hadn’t seen him. Larry walking nearby was enough to push Dad back. Unenergetic today, but not a slacker, Dad had been on watch duty the whole time. I have seen the kind of activity in this video too often. Our Animal Care and Control Department, ACC, points out that some individuals continue to allow their dogs, “off-leash in active coyote areas despite education, posters, flyers, signs and barriers all warning dog owners to abide by the law and keep their dogs on-leash, or, better yet, avoid the marked areas entirely.” So a few irresponsible individuals are setting themselves up for unexpected coyote encounters by not following the simple rules. The only method to keep coyotes and dogs apart is to leash the dog in a coyote area. If you and your dog see a coyote, walk in the opposite direction, not towards it. We are lucky to have an Animal Care and Control Department which is taking a proactive stance to protect both our native coyotes and companion pets. ACC has recently cordoned off areas and instituted temporary park closures — they have been forced into doing this because a few dog owners continue to be irresponsible towards their pets and our wildlife, putting both at risk. People have asked about “relocating” our coyotes — this is not an option since another coyote would just fill the vacant niche left behind, and relocation is a death sentence for any moved coyote. Coyotes are here to stay and the community needs to learn how to peacefully coexist with them. Ninety-nine percent of everyone I speak to loves having coyotes — a bit of the wild — in our urban parks. It brings back something that they’ve been out of touch with for too long. Note that it is only a few individuals who are irresponsible. Please be a responsible pet guardian: leash your dog in a coyote area or visit parks which do not display coyote warning signs. We only have ten coyotes in the city — it doesn’t take a lot of effort to coexist with them. My dog Holtz and I ran into Mister Wednesday while walking in my Los Angeles area coyotes’ field. I was glad to see him ahead of us, he going down a path on which we were going up. The photographs show that Mister looked, scraped, evaluated and fled. In contrast, Dad’s scraping display signals that next he will approach. It took me some time to notice body language in the photographs that Holtz probably instinctively knows how to interpret. The photographs show that Mister’s feet are pointed away from us before, during and after the scraping display. In comparison, Dad stands on a perpendicular to us when he scrapes. Dad’s perpendicular stance doesn’t suggest fight or flight. Mister’s angled away stance suggests flight. I wonder if a perpendicular stance creates more stress in the observer for being ambiguously not fight, not flight. In any case, the perpendicular stance Dad uses shows his full length and a better view of his raised hackles, an awesome side view of a coyote’s power. Mister fled. Holtz and I continued along out of the field and Mister was nowhere to be seen. (Dad would have visibly followed Holtz and me). Near the exit, on the other side of a chain link fence, Dad appeared and began scraping, positioned on the perpendicular. Not needing to see more, we left and so did Dad.